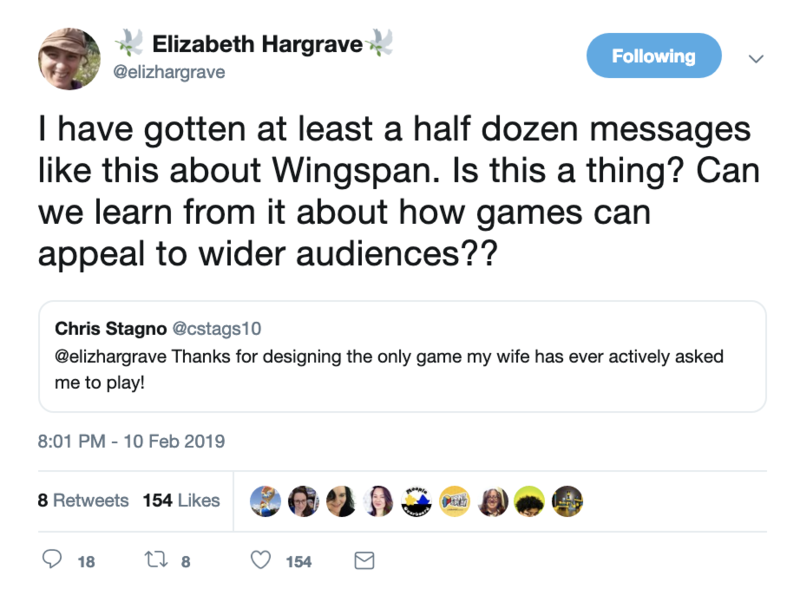 Wingspan, the bird-themed engine-building game designed by Elizabeth Hargrave and published by Stonemaier Games, is one of the big releases of 2019. Everyone’s been talking about it since January, and for good reason. It features beautiful art and production design, unique high-quality components, and mechanisms that are easy to teach and all work together smoothly. I could talk about all of these things and more. What I want to talk about, though, is why Wingspan is an important game. 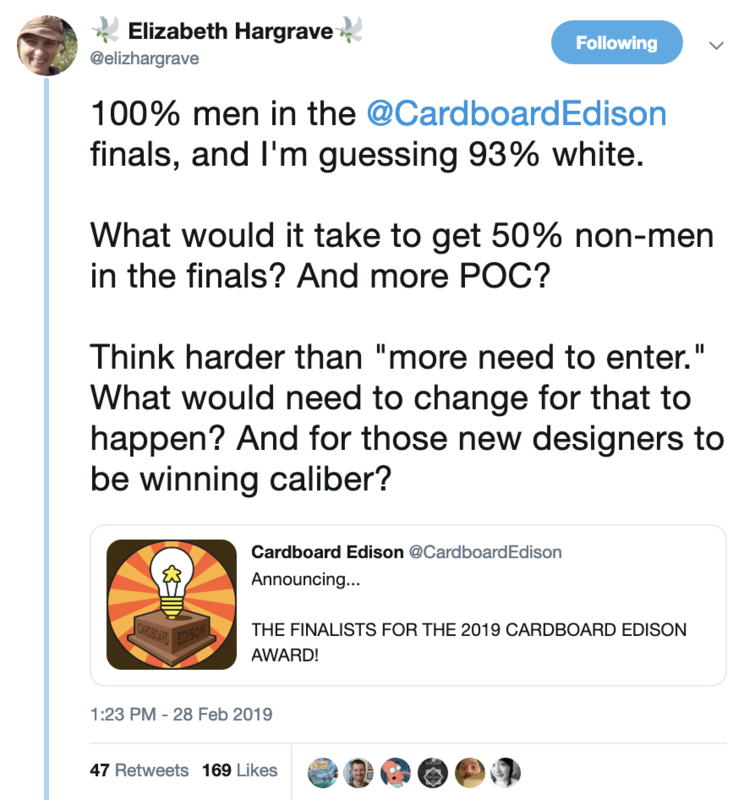 She’s not singling out Cardboard Edison here, and in fact Suzanne and Chris are doing great things to support diversity in the board game community with their platform. This is just one example of how board gaming isn’t immune from structural sexism and racism. The #OscarsSoWhite hashtag has been around for several years, critiquing the lack of racial diversity in Oscar nominations. These same biases exist in board games, no matter how many people say things like “it doesn’t matter who sits around the table, we’re all just here to play games.” Ignoring a lack of diversity and assuming that it will work itself out “on merit” is a willfully ignorant perspective that ignores the long history of white patriarchy that has reinforced inequalities and needs to be actively opposed in order for change to happen. An analysis of the structural changes that the board game industry needs to make in order to increase diversity is outside the scope of this article, but one of those changes is simply visibility, and that brings us back to Wingspan, a prominent game designed by a woman. That may seem obvious or unremarkable, but think about other games that have gotten this kind of buzz, and think about the names on those boxes. Representation matters, both in the box (diverse character artwork has been becoming more common, which is fantastic), and on it. In addition to the designer, Wingspan also names the artists, Natalia Rojas, Ana Maria Martinez Jaramillo, and Beth Sobel. Seeing all these women’s names on the box makes me feel more connected to the game, and it’s not just me. I loved designing games when I was a kid. (They were roll-and-move, with way too much text on the cards.) But “board game designer” was never on my when I grow up I want to be a list. I’ll grant that there were no names on the boxes of Monopoly and Mousetrap. But there were names, lots of male names, in science and math and other things I liked, things that faded away as I got older. It’s one thing to tell a kid that they can be anything they want to be. Seeing people like themselves in the world makes all the difference. Diversity in design also benefits the communities of people that play board games. Everyone talks about “gateway games” that are good for bringing new people into the hobby. They’re usually talking about games with mechanisms that are easy to understand and easy to teach, with a small decision space so that players can easily understand their choices and how those decisions may affect their game. Ticket To Ride is the quintessential example of a gateway game, for good reason. It’s based on a simple set collection mechanism that’s familiar to anyone who’s ever played with a deck of cards. It has fun little train pieces and a colorful board. You can print your own 3d Owl here. Then it introduces the idea of hidden goals and end game scoring, common parts of many modern board games. Other commonly mentioned gateway games include Lords of Waterdeep, Dominion, and Catan. These games introduce mechanisms like worker placement, deck building, and resource management. Simplicity of mechanisms is a good feature for gateway games, but I’d argue that themes are at least as important. Fantasy and (usually European) historical themes are very common, and while sometimes they are very well implemented and highly appealing, many times they can just seem kind of generic and underwhelming. Often these themes are so taken for granted that the design of the game mostly ignores them, leaving us to either fill in the blanks ourselves with our general knowledge of elves and orcs and medieval times, or to ignore the theme altogether and just think about cubes. And let’s be honest: “So you put your meeple on this spot and get two orange cubes” isn’t immediately very interesting. A unique and interesting theme opens the door to new players in a way that simple mechanisms don’t. “Do you want to play this beautiful game about birds?” is an easier sell than “This game is an introduction to worker placement!” Wingspan’s bird theme is not only unique, it’s built into the very bones of the game. The stats and powers on the bird cards relate to the bird itself, which is depicted beautifully. The birdhouse dice tower is delightful and the dice themselves are wooden instead of plastic, which gives them a rustic feel that suits the nature theme. The egg tokens come in colors that reflect the variety of real birds’ eggs, and the bright watercolors of the board recall nature landscapes and make a great background for the art on the cards. Even the mechanisms connect to the theme: spend a card for another food token (more birds gather more food); spend a food token for an additional egg (well-fed birds lay more eggs); spend an egg to draw an additional card (more eggs hatch into more birds). This high level of thematic integration makes the game easier to explain and beautiful to play with. At my table, we like to read the bird fact at the bottom of the card when we put it into play. The little details like this really make the game something special. This level of attention to detail and high production quality is something that Wingspan’s publisher, Stonemaier Games, is known for. And this is another important aspect of visibility. Stonemaier Games is a well-known and well-liked company run by designer and publisher Jamey Stegmaier. He publishes his own games and is beginning to publish games by other designers as well, including Wingspan. Stegmaier’s decision to publish Elizabeth Hargrave’s game is a great stride towards diversity in the board game industry, because a new game from Stonemaier Games gets the attention of hobbyists and reviewers based on the high quality and popularity of the company’s previous games. Given the number of new games that are released each year, or even each month, getting the kind of buzz that Wingspan received before reviewers even started getting their early copies is not easy for most designers. Seeing a woman designer rightfully receive this level of attention is encouraging for women who want to design games, for people who want to see a wider variety of themes in games, and for everyone who understands that diversity makes gaming better for everyone. Wingspan is a fun, beautiful, and interesting game, and it’s also an important one. It’s made me happy to be part of the world of board games and hopeful that we’ll continue to see more diversity in all aspects of our community.